Boea has species originating from Australia, China, India, Malaysia, Burma, Philippines, Polynesia, Solomon Islands, Thailand, Papua New Guinea, Indonesia, Nepal, Bhutan, Cambodia, Vietnam and Laos. Boea make attractive indoor plants, many growing in habitats that transfer successfully to cultivation. 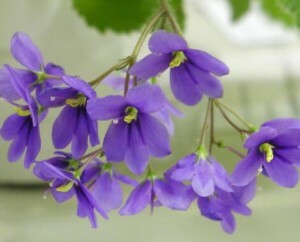 For example, B. hygroscopica, also known as the Queensland rock violet in Australia, occurs in Cape York Peninsula and Northeast Queensland as far south as Rockhampton, within an altitude range from 60–900 metres (200–2,950 ft). It grows along creek beds, on moist banks, moss-covered rocks in rainforest, open forest, vine forest and gallery forest. Some Boea species are known as types of the resurrection plant, due to their ability to survive desiccation (e.g. B. hygrometrica and B. hygroscopica).